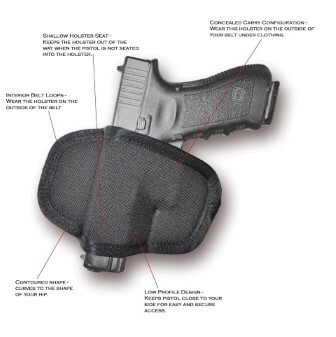 Home > Firearm Accessories > The Impulse - Semi-Automatic Pistol Holster Sub-Compact 2"-2.5"
The Impulse is a very low profile holster with a very shallow seat that is virtually undetectable when carried concealed. Uses compression to keep the firearm retained. Fits most semi-auto pistols. The Panther - Semi-Automatic Pistol Holster Compact 3"-3.5"
The Shadow - Semi-Automatic Pistol Holster Compact 3"-3.5"